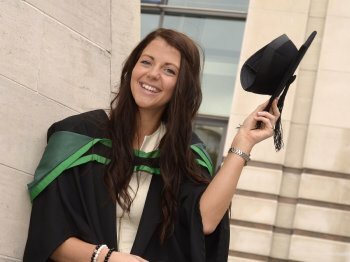 A University of Ulster student, who received funding to develop a disability awareness sports programme in primary schools across Northern Ireland, graduates today. Sara-Jayne McClung, from Omagh, was a Schools Coordinator for the University’s Sports Outreach Programme during her placement year. “During my placement I was encouraged to apply for funding from Sports UnLTD, which is part of the charitable organisation UnLtd – the Foundation for Social Entrepreneurs. Sara-Jayne, who will graduate with BSc Hons Sports Studies, was also involved with the Sport for LIFE programme, encouraging children to take up physical activity for life. She also received a WASS scholarship in her final year for Outreach. Sara-Jayne, a former member of the Elks Ladies Hockey team, helped set up a new student gymnastics club, which won the Jim Allen Merit award in its first year. She was also heavily involved with the gymnastics programme at Ulster, GymFUN, and gained Level One and Two coaching qualifications in general gymnastics through this programme. “This allowed me to coach at the University’s children’s gymnastics club. Through GymFUN I have moved from volunteer to scholar to a paid coach and finally, in my last year to Head Coach and mentor to the new first years.